February 22, 2018 – Toronto, Canada – DAZN Canada, the world’s leading sports live streaming service, today announced the launch of the DAZN channel on Roku® streaming players and Roku TV™ models in Canada. 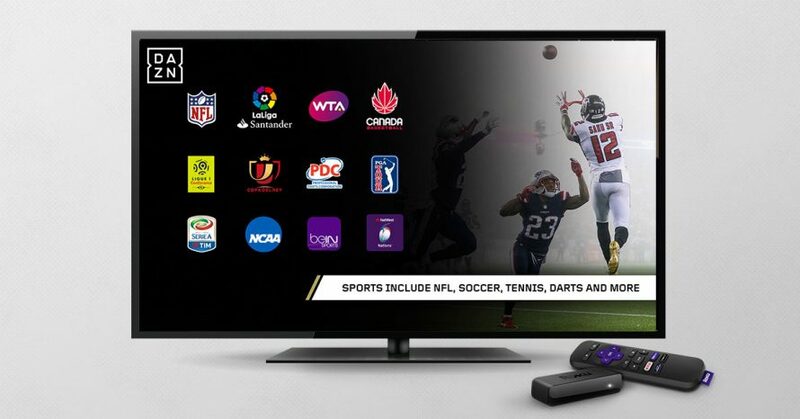 Roku users across Canada will now be able to live stream and catch-up on DAZN’s extensive range of sports content such as NatWest 6 Nations Championship, top European Soccer leagues such as La Liga, Serie A and Ligue 1, Champions League via its partnership with BeIN Sports, the 24/7 NFL Network, as well as Russia’s Kontinental Hockey League, FIBA Basketball, WTA Tennis and MotoGP. The announcement comes at a time where momentum continues to build around DAZN Canada’s growing platform, including some recently-added offerings that include more than 30 PGA TOUR events, Tie Break Tens (the hottest new competition in Tennis), Red Bull Air Race and World Snooker. DAZN supporters will also have every LIVE game of the 2018-19 NFL season – including pre-season, regular season, the playoffs and next year’s Super Bowl in Atlanta.